The above infographic is courtesy of the CDC (see attribution for the direct link). To those of us involved in treating addictions talking with many people who are addicted to opioids, getting them to see the problem, and helping them prevent accidental overdoses and death is an everyday occurrence. The prescription opioid problem is widespread and has been a reality for the last 15 years even though it seems to have hit the news in about the last 5. That probably coincides with heroin use starting to escalate. The driving force for that has been economics. Heroin is generally available in most areas for about a quarter the cost of diverted prescription painkillers. In the past 5 years I have probably given about 50 lectures on the topic to physicians and graduate students and been actively involved in the clinical care of individuals with heroin addiction only or heroin addiction in addition to a number of other addictions. When I got a post from the American Psychiatric Association (APA) on my Facebook feed last week it piqued my interest. Part of what I teach is how failed policy is the root cause of the opioid epidemic and what physicians can do on an individual basis to correct the problem. I was very interested to see what the APA had to say at a policy level. Reading through the document that is really a blog post from the Medical Director the answer is "not much". It appears that the APA has joined a Task Force of other professional organizations that includes that other great laggard the AMA. They will be working to identify "best practices" and implementing them as soon as possible. Using Prescription Drug Monitoring Programs (PDMPs) is encouraged. There will also be the focus on stigma. Dr Levin states: "The APA maintains that substance use disorder is a medical condition that can be successfully treated, and we are actively advocating on behalf of the patients who are too often stigmatized by their community and disenfranchised by insurance carriers who fail to comply with mental health parity laws." 1. Irrational policy initiatives: There is no doubt that several policy initiatives to liberalize opioid prescribing were responsible for the start of this epidemic in or around the year 2000. Making pain the "fifth vital sign", encouraging the use of opioids for chronic non-cancer pain, treating minor conditions with opioids, and a widespread policy initiative that encourage more aggressive treatment of pain even though specific measures were not know are among these initiatives. I use the word irrational here to mean speculative initiatives that were not based on science. 2. A serious misunderstanding of the current problem: When all else fails blame physicians. That is a highly effective political strategy that worked to consolidate control of the health care system under business and government. To many of the politicians involved it flowed directly from their negative campaigning experiences. In this case, the opioid problem is being framed at some level as a problem of inappropriate prescribing by physicians. Some physicians are being subjected to criminal prosecution for deaths and complications that have resulted from opioid prescribing. There are no references to the policy changes that occurred in the late 1990's that led to this change in physician prescribing behavior - the loss of gate keep functions in particular. 3. A misunderstanding of the epidemiology of the problem: The upper decile of opioid prescribers (total number of prescriptions) account for 50-60% of all opioid prescriptions. These prescribers are almost all family physicians, internal medicine specialists, and mid-level prescribers. Available databases allow for rapid identification and intervention with these prescribers and that is where resources should be focused and not on all physicians across the board. A mechanism for feedback on an individual physician's or physician extender's ranking in terms of their prescription of controlled substances is needed as well as individual access to that information. 4. A serious misunderstanding for the overprescribing problem in general exists: As I have previously pointed out, opioids are one small group of medications that are overprescribed in the US. Practically everyone who wants this problem to go away sees it as a cognitive problem or knowledge deficit. If the physician involved just knew more they would not prescribe pain medications this way. In fact, it is a much more complicated interpersonal, social and intrapsychic problem for physicians. Until there is a widespread acknowledgement of this - all of the CME courses in the world on appropriate opioid prescribing will not change a thing. 5. There is a widespread cultural problem: Opioid hoarding in medicine cabinets across the country, neighbors sharing opioids and neighbors and family members discussing what is the best (translation best = most euphorigenic) is a major problem in the US. Many politicians have agreed that America's "insatiable appetite for illegal drugs" fuels the international drug trafficking problem. It also fuels the opioid epidemic. There are very few initiatives focusing on cultural change. 6. Misunderstanding the problems inherent in prescribing addictive drugs: Most physicians are not aware of the unconscious and conscious elements that are activated in susceptible individuals when they take addictive drugs. 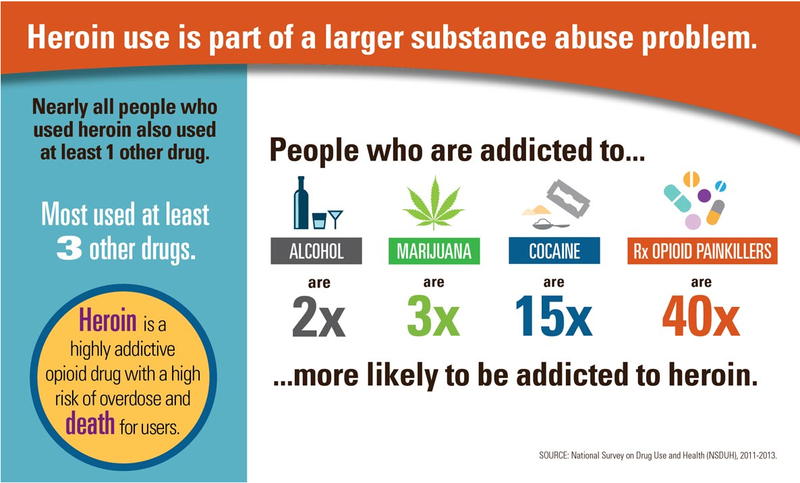 There are widespread misconceptions in this area that lead to the prescription of addictive drugs during active addiction, not assessing the risk of prescribing addictive drugs to a person in recovery, and failing to assess some of the indirect signs of addiction in patients who deny that they have a problem with addiction. There is also a belief among many physicians that if their goal is to help people that well intended prescribing will not lead to problems in the future. These are 6 areas that the APA could be focused on. I don't think that you will see that analysis anywhere else. I expect that "best practices" will fall disproportionately on the average physician and be a waste of time on their time and energy. But it does fall back on the time honored political strategy of taking the heat off of the people who really failed and pretending it is a physician based problem. The CDC has done great work in this area and their site should be closely monitored for new data relevant to the problem. A recent opinion piece in the New York Times, by George Makari, MD has me shaking my head. The thesis was that a recent headline grabbing story (what's wrong with that criteria?) on the effects of comprehensive treatment of psychosis as opposed to treatment as usual surprised many and highlighted the problem with reductionism. He bemoans the fact that the reaction to the story was one of surprise. He doesn't specify who was surprised. I certainly was not surprised. I attended recent meeting and somebody in the audience asked Daniel Weinberger if he was surprised. His response: "They spent $15 million dollars showing that good treatment is better than bad treatment." He certainly was not surprised. I have not heard about Eric Kandel's response, but based on his 1979 paper on plasticity and what happens in psychotherapy - I doubt that he would be surprised. The exact population of who might be surprised by these findings seems poorly defined at this point in time but I doubt that it included any psychiatrists. Speaking for myself, I will elaborate on why I was not be surprised. At one point, I was the Medical Director of a community support program of a group of about 100 outpatients in the State of Wisconsin. According to the state statutes, access to the program depended on diagnosis and degree of psychiatric disability. You could only apply if you had a diagnosis of Bipolar Disorder, Major Depression, Schizophrenia, or Borderline Personality Disorder had significant associated disability or were at high risk for hospitalization. The clinical goal of the program was to reduce hospitalizations, maintain independent living, and facilitate employment. The program was staffed by a psychologist, 2 social workers, three nurses and me. When I arrived, one of the early dynamics was to frame problems in terms of medication needs. That translated to increasing the dose of a medication (typically an antidepressant or antipsychotic) in crisis situations or other emotional crises. The patients in the program had chronic problems and symptoms that did not necessarily respond to medication. One of my first steps was to start to discuss problems and solutions with the patients. I met with all of the patients and did supportive psychotherapy when possible. We had team meetings every morning and problem solved around the needs of the patients in the community, how to solve any crises, and how to approach people in ways other than medications. I tracked the total dose of antipsychotic medication and days of hospitalization as outcome measures. At the end of three years, the days in hospital had gone down from about 14 days per person to less than 1, and the total dose of antipsychotic medication had gone down a total of 600 mg chlorpromazine equivalents. My point is obviously that comprehensive care of patients with severe problems results in improved outcomes. In this case lower doses of medications were used and the patients spent less time in the hospital and more time at home. My orientation and ability to implement such a program was not an accident. I was trained by Len Stein, MD at the University of Wisconsin. Dr. Stein was a pioneer in the area defined as community psychiatry. He was motivated by realizing that once people were in large state hospitals - it was very easy to warehouse them in overcrowded conditions. 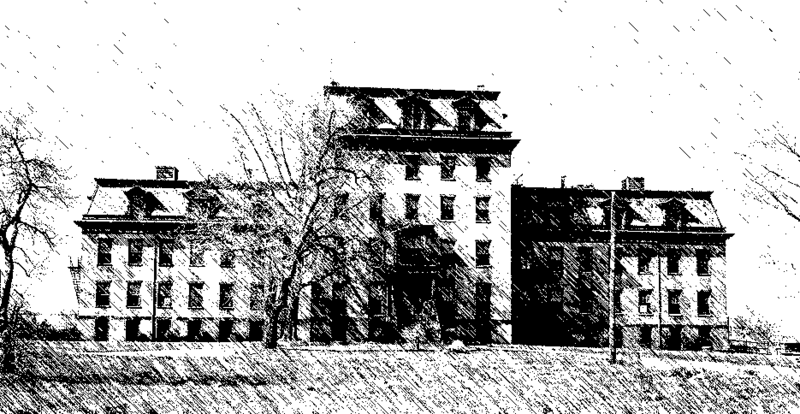 Nobody seems to recognize it but overcrowding and suboptimal conditions were the state hospital equivalent of managed care rationing. Once your state hospital is on the spreadsheet of a state bean counter with no accountability to patients or their families rationing and fewer and fewer resources are the order of the day. In a community psychiatry seminar, Dr. Stein projected a slide of a gymnasium-sized room populated by male patients with hundreds of cots aligned edge to edge. There was no room to walk between the cots. That was his motivation for moving people out of these state facilities and into their own housing. When I trained, there were three programs with independent living and quality of life as the primary goals and the staff involved in the programs was very good at it. My effort just extended that skill set. Contrary to the "surprising" results of the quoted study - I did the same thing back in 1986! If it is true that we have known for 30 years that comprehensive care for psychiatric disorders trumps "treatment as usual" what is all of the rhetoric about? Dr. Makari seems to want to make this into a mind-brain argument. In other words, the biopsychosocial approach and the uncertain effect it has on the mind as opposed to a brain based approach that looks at specific mechanisms of action and seems to be focused on psychopharmacology. He points out for example that the highlighted study would possible not qualify for current NIMH funding unless it looked at specific brain mechanisms. He throws around the word "reductionism". Anytime reductionistic or reductionism is used rhetorically in the same sentence with psychiatry it is pejorative. My old psychoanalytic teacher would refer to anyone who talked about brain biology as a "dial twister". The implication is that the reductionists are somewhat simple minded largely because they cannot accept the uncertainty of dealing with an organ that has poorly defined inputs and outputs. Kind of a double whammy of rhetoric - you are a unsophisticated reductionist and you really can't see the big picture. Are things really that simple? Are these arguments accurate? 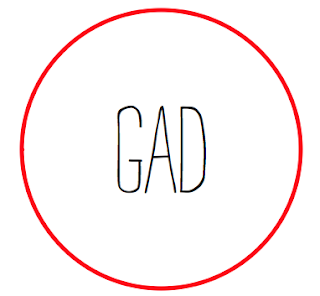 Are there problems with equating reductionism with "bad". Of course there are major problems. The first is the statement that inherent to the proposition that mental illness is a brain disease is "the implication that psychological and social events somehow are not also brain events." This is a serious misreading of the definition of plasticity or experience dependent changes in the brain. When I give my neurobiology of the brain lectures. I use Kandel's original New England Journal of Medicine article that discusses brain changes in a patient and a therapist conducting psychotherapy and how those changes are associated with brain plasticity. I give further examples - weightlifting, playing the violin, and how the typical stream of consciousness is profoundly altered by drug addiction. There is no neuroscientist or biological psychiatrist I know who would suggest that psychological and social events are not brain events and there are numerous experimental paradigms that look specifically at how these events occur in the brains of animals. 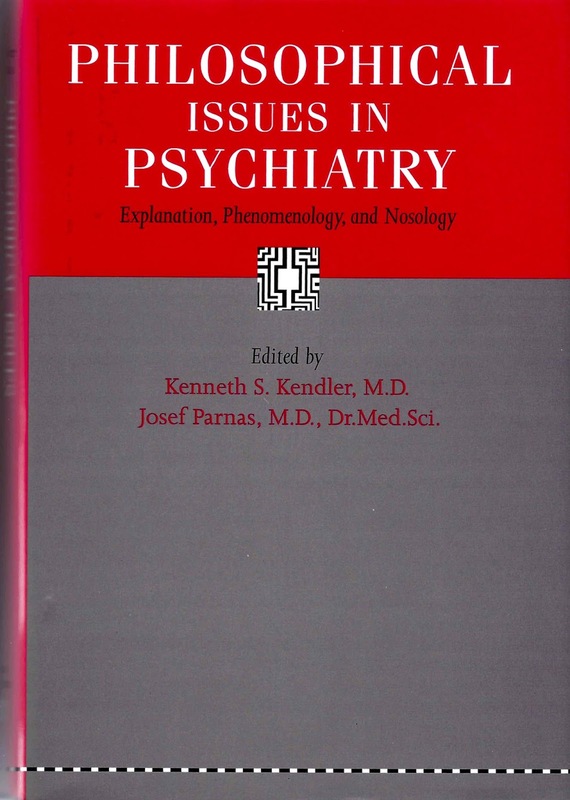 "With luck, studies like Dr. Kane’s, which undermine these suppositions, will help move us away from such narrow thinking and embolden the substantial community within psychiatry that has never accepted such reductionism." The suppositions in this case are that mental illness is a brain disease and that social or psychological events have no brain representation. The argument is based on that false premise. But further the use of the term "reductionism" is instructive here as previously noted. By definition reductionism applies to many proposed etiologies of psychiatric disorders. Those etiologies can be studied at a molecular level or at a higher level. Schaffer (2) says that a model is reductive if it "employs standard biochemical and molecular entities to account for psychiatric symptoms and disorders". Non-reductive models discuss "causal connections at higher levels of aggregation." He illustrates these definitions by looking at Kendler's non-reductive account of major depression. 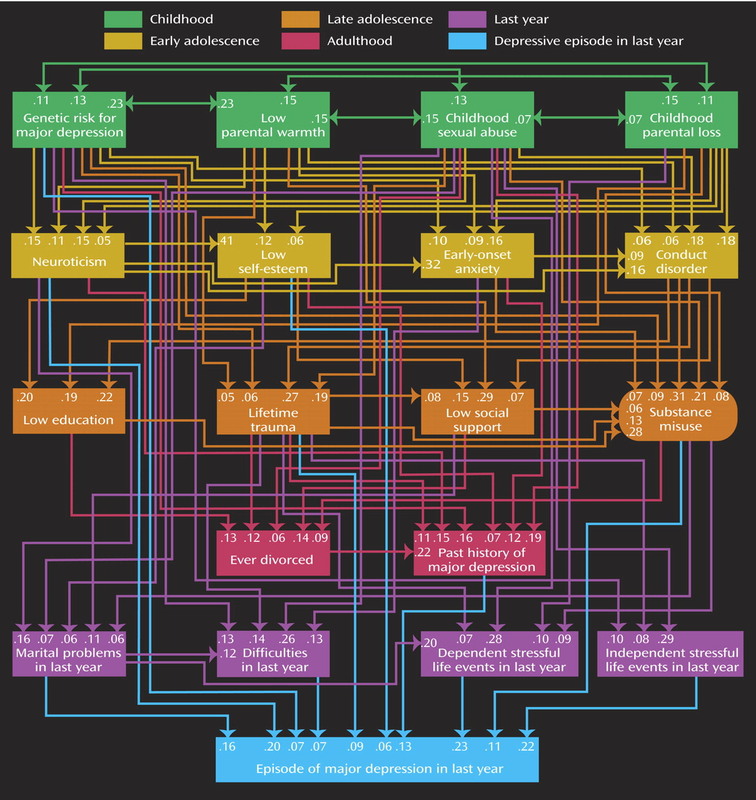 Kendler has used path analysis to look at clinical variables relevant to psychiatric disorders and although I do not have access to the one used in the book, here is a typical example. The model looks at life stages, familial factors and psychological factors and all are higher levels of aggregation than molecular mechanisms. At the reductive side of things he examines Harrison and Weinberger's proposed genetic susceptibility genes for schizophrenia. At the time the book was written the author limited the discussion to 5 genes. He also looked at the continuum of psychiatric genetic models ranging from basic and advanced genetic epidemiology being non-reductive, gene finding partially reductive, and molecular genetics fully reductive. It seems perfectly logical to me that the study of brain biology proceeds in the same way that the biology of all living organisms proceeds. The difference is that we are studying an infinitely more plastic organ with significant computational power. There is clearly a lot of phenotypic heterogeneity that is unexplained in psychiatric diagnostic categories. It is highly unlikely that refining diagnostic descriptors or applying clinical methods will lead to any significant change in the diagnostic or treatment process. I don't understand the reluctance to go after more specific mechanisms or treatments. The idea that a molecular or clinical focus in psychiatry is the problem with psychiatric services is also misleading. As I hoped to point out by my mental health center example, psychiatrists know all about comprehensive care but they are rarely able to provide it. They have known about how to provide it for decades. State asylums became overcrowded and not therapeutic due to the financial management of the system by state governments. The bean counters have moved out of the asylum and they are now integrated at every level in the health care system. They all have a very strong bias against the comprehensive treatment of mental illness. They insist that patients with severe psychiatric problems do not get comprehensive evaluations, that they are discharged before they have been adequately treated, and that any associated addictions are poorly treated. They do not have the same biases against people hospitalized for medical or surgical illnesses. They have in effect, moved the poorly run, overcrowded asylum model into the general health care system. Any comprehensive care for severe mental disorders in such a system is an advertising phenomenon rather than reality. The reductionism argument is good for New York Times opinion pieces. It may sell a few more papers or get a few more clicks online. Unfortunately it perpetuates an old pattern of blaming people and psychiatrists in particular for the shortcomings of a non-system of mental health care in this country that is set up to favor large health care businesses. You can blame psychiatrists all you want for that - but until people realize that the real problems are the product of business and politics - and not the scientific interests of psychiatrists - nothing will change. 1. George Makari. Psychiatry’s Mind-Brain Problem. New York Times. November 11, 2015. 2. Scaffner KF. Etiological Models in Psychiatry - Reductive and Nonreductive Approaches in Philosophical Issues in Psychiatry. 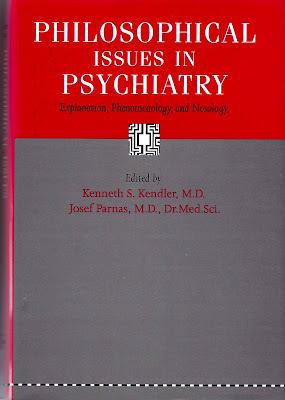 Kenneth Kendler, Josef Parnas (Eds), The Johns Hopkins University Press, Baltimore, 2008: pp 48-98. Image is Microscope 1 by Bill3t Hughes on Flickr. Reposted as noncommercial via Creative Commons License on 11/14/2015. The original work is not modified. First off a clarification. 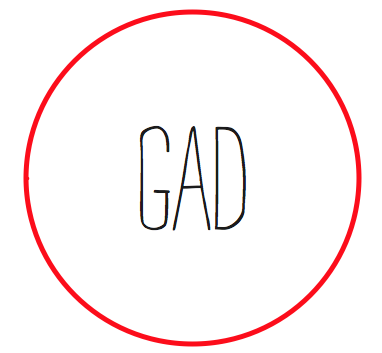 I am talking about the specific case where a short acting medication is added to a long acting form of the same medication and not "as needed" medication in order to determine the correct daily dosage. In my line of work it occurs in two situations, long acting stimulants and their immediate release versions and long acting opioids and their immediate release versions. I will illustrate that these practices are driven by myths about the medication rather than pharmacokinetics. There is always the additional consideration about addiction lurking in the background, but the conscious and unconscious determinants of addiction frequently depend on the myths that I will be discussing about medication effects. The example that I will use here is Concerta (long acting methylphenidate) compared with immediate release methylphenidate. 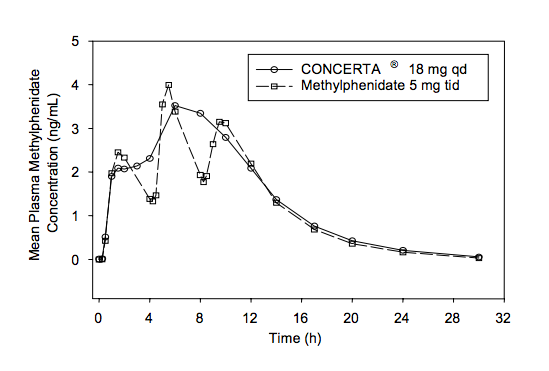 The graph from the package insert above shows the plasma concentration from a single 18 mg dose of Concerta and three successive 5 mg doses of immediate release methylphenidate. As noted in the comparison of the curves and additional pharmacokinetic parameters the curve associated with three successive doses of immediate release methylphenidate is nearly identically replicated by a single dose of Concerta. What is happening when additional doses of a immediate release methylphenidate are prescribed to a person who is already taking Concerta? I have seen this happen with sustained release stimulants and sustained release opioids. I have seen it happen as a single dose of the immediate release preparation or multiple doses over the course of the day. The patient is usually advised that this is a "rescue" medication that they should take if needed. The first possibility is that the dose of sustained release medication has not been optimized and a higher dose of the sustained release medication needs to be given. That is usually not the case. The most frequent reason for taking the rescue medication is that the patient believes they are experiencing breakthrough symptoms and for a moment they need a higher dose of a medication. There are serious problems with that concept. As can be seen from the curves comparing Concerta and methylphenidate it does not make pharmacokinetic sense. Any additional dose of immediate release methylphenidate on top of Concerta would greatly increase the expected plasma concentration at that point. The main problem is that both ADHD and non-cancer pain are chronic conditions. By definition they do not respond well to medications and they will not resolve typically with any amount of the medication. Many people who take stimulants for ADHD assume that the human brain can be fine tuned with a medication. There is also a widespread myth that they are cognitive performance enhancing drugs. The real effects of stimulants are modest at best and there is no good research evidence to support a cognitive enhancing effect. A similar bias exists for the use of opioids for chronic non-cancer pain. The person believes that "If I take enough of this medication - my pain will be gone." Study after study of opioids for chronic non-cancer pain shows that pain relief with opioids is modest at best, with results very similar to what would be expected with non-opioid medications like gabapentin and antidepressants. There are secondary problems with believing a medication will produce perfect cognition or perfect pain relief. The first is a tendency to see any medication with such powerful abilities as being able to solve a number of problems that are not the primary indication for the medication. As an example, with a stimulant - if this medication has such a profound effect on my cognition maybe it can help with with other difficult problems like excessive appetite and weight problems or feeling like I don't have enough energy at certain times during the day. With the opioid the thought typically is that it can be used for mental pain as well as physical pain and it is used to treat anxiety, depression, and insomnia. Whenever a medication is not used strictly for the prescribed indication there is a risk that it will be used for "what ails you." The danger is dose escalation and addiction. There is also the risk of attributing too much of an effect to the medication when it does not appear to be doing much. A person may start to believe that they can't function without the medication but a detailed review of their target symptoms and ability to function shows that there has been a negligible effect. And finally there is the danger of taking a medication that may produce euphoria, increased energy, and create a sense of well being and not realizing that at some point that is the only reason the medication is being taken. I have had many people tell me that the medicine did nothing for their pain or cognition but that they kept getting refills because they "liked taking it." The is also the Talisman effect, but probably to a lesser extent than with benzodiazepines. Many people develop the idea that they are taking a medication that is much more effective than it really is and therefore they have to take it with them wherever they go. They are conferring what are essentially magical properties to the medication and at some level thinking that they are unable to function in life without it. They get anxious if they think about not having it or running out. This not only causes a lot of unnecessary anxiety, but it also prevents the person from using other psychological or conditioning techniques that may work as well or much better than the medication. These are some of the problems with the idea of taking a rescue medication if you are already on a long-acting form of the medicine. Physicians in general do not do a good job of explaining these potential problems or even the basic problem of taking a medication that causes euphoria or that for some other reason a person really likes taking for a reason other than the one it was prescribed for. A more widespread recognition of these problems would go a long way toward curbing overprescription, overuse, and addiction to these medications. It is clear to me that Minnesota doesn't want to hear from any psychiatrists. 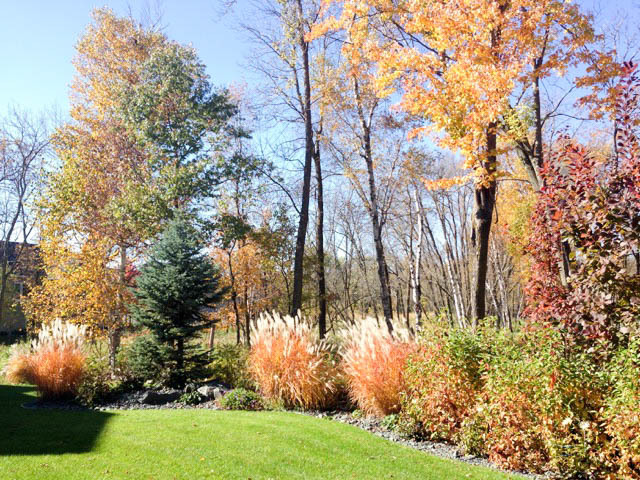 Psychiatrists in this state have been complaining about managed care, prior authorization of medications and hospital treatment, managed care medical necessity criteria and mismanagement of the state mental health systems by the State of Minnesota for as long as I have worked here and that is now 27 years. All of that work at various levels has basically been ignored by the politicians and responsible bureaucrats in this state who are quite happy to address the problems of severe mental illness by progressive rationing at all levels. That is their only response. This march toward the managed care approach to mental health has been inexorable and has resulted in major problems with access and quality of care. I have been writing in various formats about the problem of mismanaging acute care beds in Minnesota for at least 15 years. What do I mean about mismanagement? The problem started in the late 1980s when the state of Minnesota gave carte blanche to one of the local insurance companies to start denying alcohol and drug related admissions to inpatient psychiatric units. Anyone with a sparse knowledge of addiction knows that about 70% of people with addictions have significant psychiatric morbidity and many are at much higher risk of aggression or suicide if intoxicated. That was not enough of a deterrent to prevent this insurance company (with full collusion of the State) to start denying psychiatric admissions to anyone with an addiction or eventually to anyone with acute alcohol or drug intoxication. 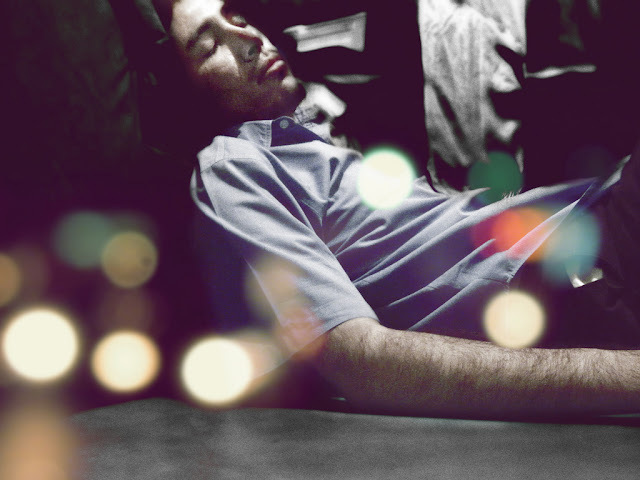 The effects of those denials filtered through the entire acute care system and eventually intoxicated people were held in emergency departments until they were less intoxicated, sent to county detox units where they got no medical or psychiatric care, sent to jail, or discharged to the street. In some cases people were discharged to the street with a bottle of benzodiazepines and expected to manage their own detoxification. Many of those patients take the entire bottle the first day. None of those pathways leads to sobriety or treatment of associated medical and psychiatric conditions and it is not an acceptable level of medical care. Treatment of mental health conditions has fared no better. At some point the vague concept of "dangerousness" became the only reason that a person with a severe mental illness could be hospitalized. In some cases it was a "dangerous enough" standard. In other words if you happened to have chronic suicidal ideation or self injurious behavior, the gatekeeper (who is usually an emergency department (ED) social worker) has to decide if you are dangerous enough to admit. That combined with bed availability, other persons needing admission, the availability of psychiatrists to cover the beds, any associated intoxication states, and even the likelihood that a probate court would hold or commit the person led to a gauntlet that even outpatient psychiatrists could not negotiate. Outpatient psychiatrists from the same clinic could not admit their outpatients to hospitals run by their colleagues. That led to more and more psychiatrists advising patients and their families to just go the the ED and "let them sort it out." The ED provides no psychiatric care - only a triage decision on admissions. This quasi-system of care results in a large circulating pool of people who are never stable, at risk for incarceration or victimization, and who never receive standard care for their problems. The unstated toll that this chaotic system takes is on the psychiatrists and nursing staff who work in it. They are frequently the first ones to be blamed for a lack of beds and timely discharges. A completely unrealistic bed situation becomes a psychiatrist not discharging people soon enough. Psychiatrists and nursing staff end up treating the consequences of patients being held too long in hospitals that are not equipped to be long term care hospitals. Patients and family members can become frustrated or irate as a result of this situation and the only people to blame are not the people who caused the problem in the first place. "Hennepin County Sheriff Rich Stanek was in Washington, D.C., Thursday, helping brief members of Congress about mental health issues and seeking additional funding for treatment beds in a state that has the 50th lowest rate of mental health beds for its population..."
It is truly a sad state of affairs when a county sheriff is advocating for treatment of the mentally ill in Congress. On the other hand it is also a direct result of the opinions of psychiatrists being actively ignored in this state for decades. 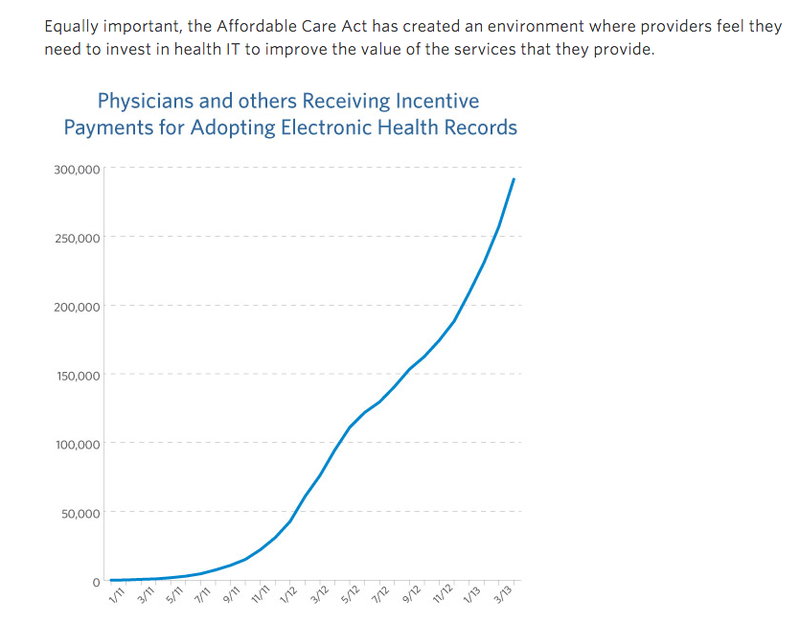 We have seen the bottom of the managed care rabbit hole - and it is called Minnesota. We take the prize with the lowest rate of psychiatric beds in the US. There are only two groups of people in this State with any credibility when it comes to critiquing this failed system of care - psychiatrists and psychiatric nurses. There is no politician or bureaucrat interested in proposed solutions - they are directly responsible for the 30 years of rationing that led to this problem. One of the retorts by state officials has been: "What's your solution?". It is time to acknowledge that this is little more than political rhetoric. They have ignored the solutions including many that have been proposed right here on this blog. Until the psychiatrists and psychiatric nurses are heard - expect continued deterioration in the treatment of mental disorders that we have witnessed here over the past 30 years. Jeremy Olsen. Shortage of state psychiatric beds leaves local hospitals jammed. Star Tribune. November 2, 2015. Karl Olsen. Minnesota's mental health system is in crisis. Star Tribune. October 16, 2015.